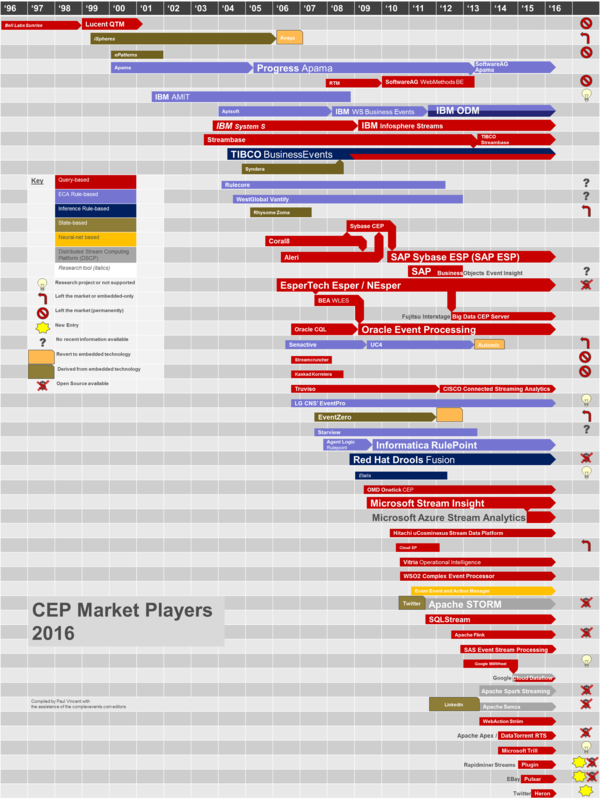 This CEP Market Players Survey covers most of the history of CEP / event correlation tooling up to Q1, 2016. It incorporates input from (and with thanks to) Roy on some of the recent market shifts and tool histories. Although comprehensive, this survey is almost certainly incomplete. Please add your comments or suggestions for updates (or ping me directly with any unattributable news). 2 Responses to "CEP Tooling Market Survey 2016"
The color seems wrong for the following names as they are Distributed Stream Computing (and not query-based): Apache Flink, Apache Apex, Heron, Google Millwheel, Google Clould Dataflow. The Google Cloud Dataflow is also known as Apache Beam. The Ebay-Pulsar is using Esper to provide its SQL-standard query capability. Kafka Streams as part of the Confluent Platform is newer Distributed Stream Computing Platform (not query based).